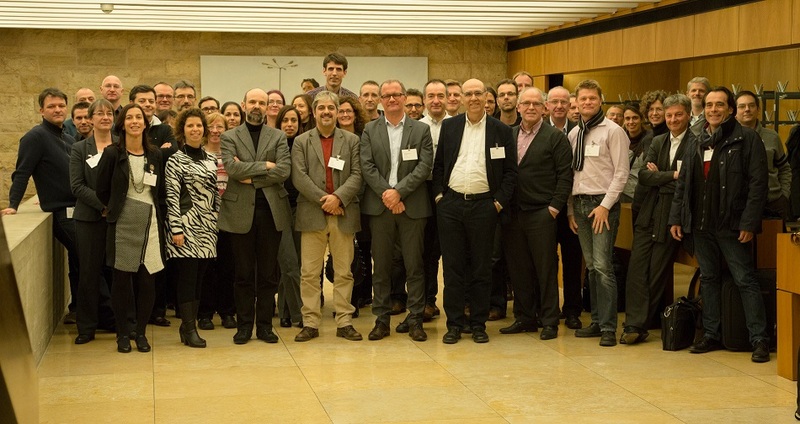 On January 25th, eTOX Executive Committee members: Fran�ois Pognan, Ferran Sanz, Thomas Steger-Hartmann and Carlos D�az held the close out meeting of the eTOX project at the IMI�s offices in Brussels. 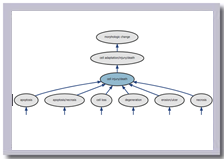 Histopathology Ontology was initially developed in the framework of the eTOX consortium, aiming at the standardisation of the histopathology findings, and it is now made openly available. On January 25th, the eTOX Executive Committee members Fran�ois Pognan (Novartis Pharma), Ferran Sanz (FIMIM), Thomas Steger-Hartmann (Bayer) and Carlos D�az (SYNAPSE) held the close out meeting of the eTOX project at the IMI�s offices in Brussels. IMI�s Executive Director Dr Pierre Meulien also attended the meeting. The main points addressed during the meeting were project's objectives and outcomes, impact, sustainability and lessons learned. 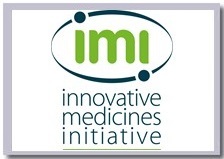 The eTOX project was granted as one of the first IMI projects starting in 2010, and successfully ended its consortium life in December 2016. With a budget of over 18.5 million �, the project was undertaken by a consortium of 30 organisations coordinated by FIMIM and led by Novartis, among which 13 EFPIA companies, 11 academic partners, and 6 SMEs. 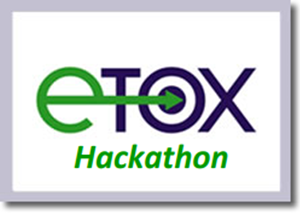 The eTOX project aimed to build a toxicology database and novel software tools to better predict in-vivo toxicology of new chemical entities in early stages of the drug development pipeline. 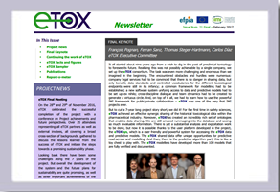 The eTOX project leaves behind as main assets: eTOXsys - a tool to facilitate the safety assessment of new drug candidates; OntoBrowser- a tool to support community-based ontology development; eTOXlab - a platform for the development and maintenance of the models. These tools are an important legacy that will be further used within eTRANSAFE, an IMI-2 project recently started, that is expected to build upon the success of eTOX. It is a key enabler, making searches possible on one of the most important data types in toxicology studies. An ontology of histopathological morphologies is used by pathologists to classify/categorise animal lesions observed histologically during regulatory toxicology studies. The ontology was developed using real data from over 6000 regulatory toxicology studies donated by 13 companies spanning nine species. The ontology has been developed by Novartis in the framework of eTOX project. More info click here. AstraZeneca makes its preclinical safety data contribution to eTOX available to the broader scientific community through its Open Innovation portal. Dr Nigel Greene, Director of Predictive Compound ADME & Safety in AstraZeneca said: �Following on from the success of the eTOX project, we are keen to further broaden access to our preclinical safety data in order to help advance the mechanistic understanding and prediction of drug safety and bring safer medicines to patients faster." Scientific researchers can submit brief project proposals outlining their intentions and the anticipated benefits from their work, after which the data will be shared at AstraZeneca�s discretion. 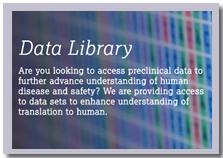 Anyone interested in accessing AstraZeneca�s preclinical data sets for data mining and research purposes can submit their proposals via the following link: https://openinnovation.astrazeneca.com/data-library.html#preclinical. This initiative represents an example of an increasingly popular trend, and shows how the eTOX project, funded by the European Commission and several pharmaceutical companies, has signified a paradigm change in the pharmaceutical industry�s willingness to openly share legacy data for the benefit of the wider toxicology community. Issue Num. 21 Final of the eTOX Newsletter has been launched in February. A final keynote by the Executive Committee of eTOX and the handover to the eTOXsys Business Broker is included. Additionally, final facts and figures for the whole lifetime of the project are summarised. To download Issue Num. 21 Final please click here. To download past Newsletters visit the Newsletter Archive. On the 28th and 29th of November 2016, we celebrated the successful completion of the eTOX project with a conference on Project achievements and future perspectives. Over 70 attendees representing all eTOX partners as well as external invitees, all covering a broad cross-section of backgrounds, gathered to discuss the lessons learned from the success of eTOX and initiate the steps towards a promising sustainability phase. Looking back there have been some challenges along the 7 years of the project. But overall the development of the system and the future plans for sustainability are quite promising, as well as other important achievements of the project. All of them demonstrating the need to jointly work private and public sectors together. IMI Officer, Hugh Laverty, congratulated all eTOX partners and its management team; there has been an outstanding learning curve, as stemming from Call 1 in IMI1. The challenge of getting of getting the data was initially underestimated but an important DB with over 7000 reports from all EFPIA companies participating in the project has been achieved. The Honest Broker model created in eTOX has been repeated in other projects. The final version of the system, eTOXsys v3 will be launched in the coming weeks. The eTOXsys TM will continue the work during the upcoming sustainability phase. A demo of the system will also be launched soon. 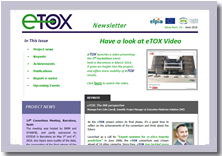 Issue Num 20 of the eTOX Newsletter has been launched in June. 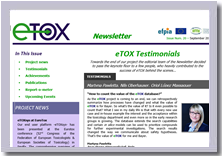 If you wish to receive the quarterly eTOX Newsletter, subscribe at editorial@e-tox.net. To download Issue Num 20 please click here. To download past Newsletters visit the Newsletter Archive. Issue Num 19 of the eTOX Newsletter has been launched in June. To download Issue Num 19 please click here. To download past Newsletters visit the Newsletter Archive. eTOX launches a video presenting the 2nd Hackathon event held at the PRBB, which also gives an insight into the project. The hackathons produced in a few days original and valuable results. This success demonstrates the importance of an appropriate approach, and the enriching effect of inter-disciplinary collaboration in an adequate scenario to push the boundaries in the knowledge of toxicology.